MALIN Head used to be considered a place 'far, far away' but that's all likely to change thanks to the magic film dust sprinkled by the Star Wars phenomenon. Ireland's most northerly point and Inishowen in general has been getting an unprecedented level of national and international coverage in recent days thanks to the big screen behemoth that is the sci-fi blockbuster. There has been no 'Darth' of great coverage in newspapers and on television all over the world - the most recent being a mention tonight by popular newsreader Fiona Bruce on the main evening news on BBC1. Given the glorious weather of recent days, our northern star Malin Head is certainly looking its magnificent best. And if the Aurora Borealis make an appearance for the director during filming these evenings - well, the sky's the limit for our future as a film location. 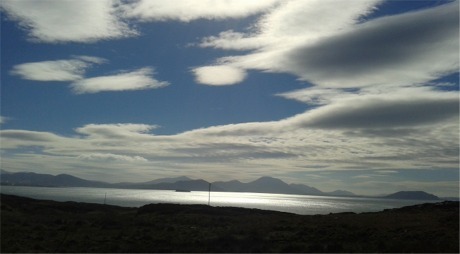 No 'Darth' of beauty here...Malin Head. It's great to see one of Ireland's most stunning locations getting its day in the sun. It's great too to see the local area soak up some of the fruits of tourism that has typically been denied the north west of Ireland for so many decades. Meanwhile, notwithstanding road closures at the immediate film location - thousands of people are expected to arrive in the area this weekend for a 'wee nosey'. They can be assured that local restaurants, pubs and cafes in Malin Head and all around the peninsula, are well and truly open for business and looking forward to giving them a fine Donegal welcome. Meanwhile, the Force is certainly with a local social media forum who have been keeping everyone up to speed with the minutiae of life when a Star Wars film crew rolls into town. Star Wars Malin Head public group on Facebook. 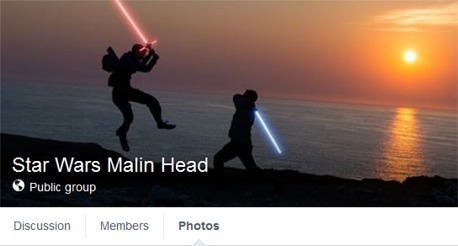 The Star Wars Malin Head public group was set up in recent days on Facebook by Carn-based, Cornish-born Matt McLaughlin Stonham. It already has over 750 members and has been a mine of local information, know-how and interesting links for the many who are hungry for updates. "Welcome to everybody coming to Malin Head this weekend for the scheduled shooting of Star Wars Episode VIII," said Matt in one of his recent posts, adding that there are plenty of "delights to be seen on the Inishowen Peninsula including some of the finest unspoilt beaches in Ireland, a lively and friendly welcome in Malin Town and Carndonagh (and) some excellent bars in the centre of town". Give that man a light saber - it could be useful in pointing the way this weekend as all roads lead to Banba.